For the first time in ages I got out my wheel; well, one of them, that is. That’s another story for another time. Two years ago at Oregon Flock and Fiber Festival I bought a fabulous fleece from my friend Harriet Beck of Beck’s Sheep Farm and U-Cut. Harriet cards and hand-dyes her Romney fleeces in the most wonderful colors, and I just couldn’t resist this one. 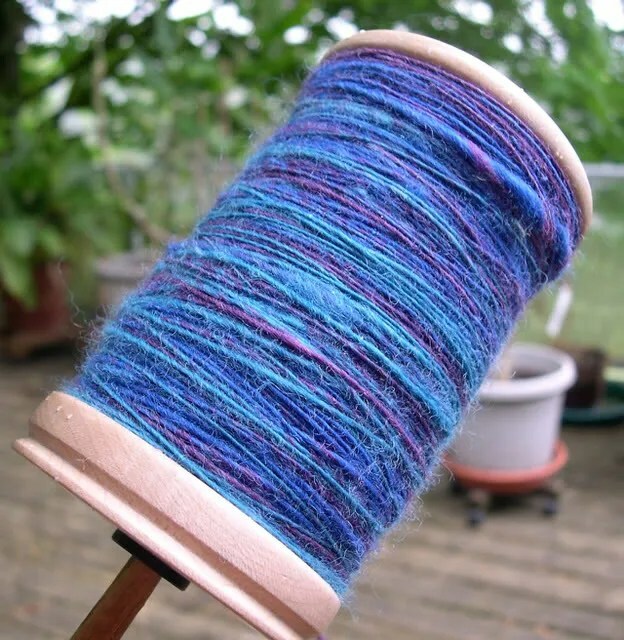 I began spinning it right away, but then as my life got busy, the yarn languished on my wheel. But several weeks ago I began again, and have really been enjoying getting back to it. No, I don’t spin ontop a planter. Just put the wheel there so I could get a better photo. 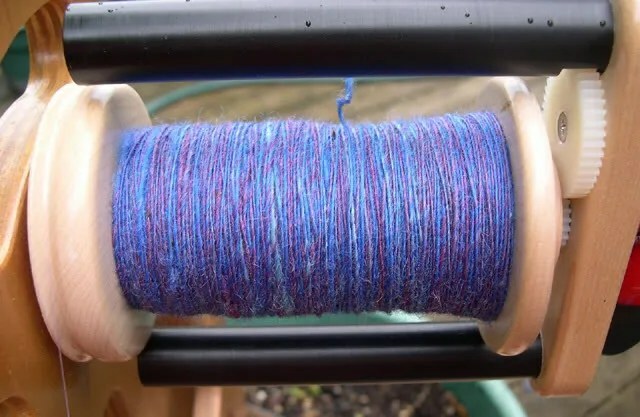 Here’s a close-up of the second bobbin I’m working on now. I love my WooLee Winder. I don’t have to stop and change hooks, so I can really get into a meditative state while spinning along. Here is the amazing fleece, what’s left of it that is. Harriet does a beautiful job carding it so that it spins like butter. And there’s very little vegetable matter in it, which makes spinning it a real pleasure. Here’s the first bobbin all pau and waiting to be plied with numbah two. 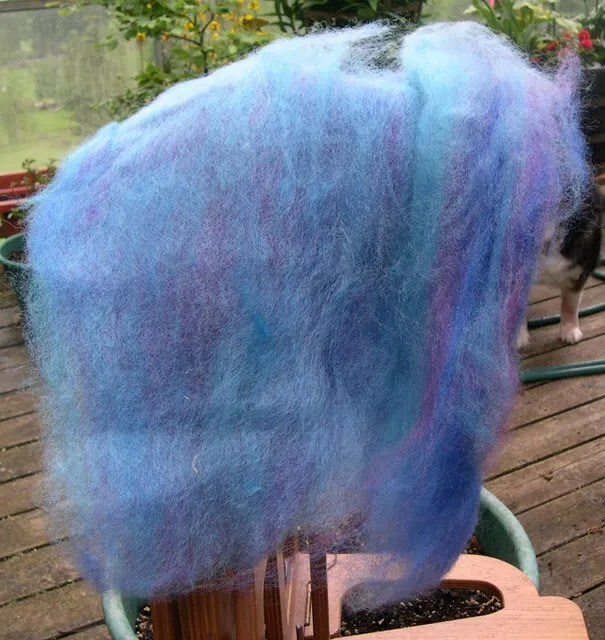 I’m spinning it pretty fine, because I know it’ll bloom when it’s plied. I hope I can adequately ply this gorgeous stuff into an equally gorgeous yarn! 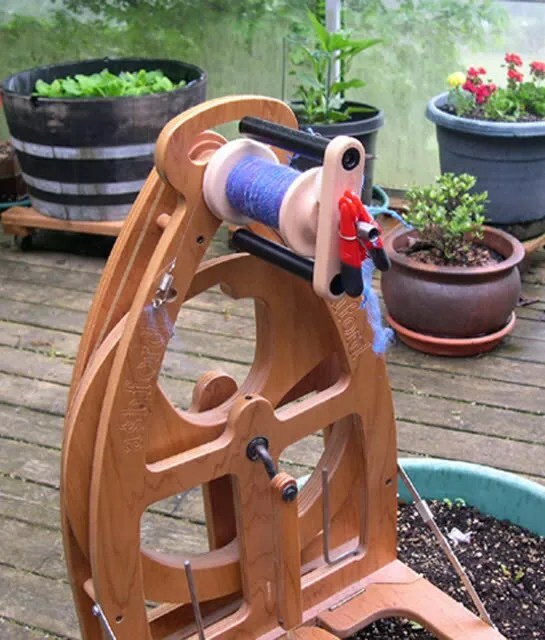 For that, I will use my Louet wheel because it has such huge bobbins. This entry was posted in Handspinning and tagged handspinning. Bookmark the permalink. Ha’come wen I wen do spinning came out all fat skinny fat skinny kine? LOL Was most ugly hehehehe was old school on a spindle kine, Navajo style. Was da first time I even wen touch wool straight off da sheep. Yum! Pretty wheel, too! What kind is it? Oh you know, this is the first time I seen your spinner. When you said spin, I thought of those big wheel kind of spinner. I guess that is old fashioned style, huh? Well, I love the color of what you’re coming out with. So interesting. that color is amazing! sooo pretty … it speaks to me… reminds me rain storms at dusk along the ko’olaus…. dat was one of fav thing back home… da rain… cool, but warm, but wet, just nani! Oh wow that is so beautiful!!!! You spin?? That’s GORGEOUS fleece. I have 2 pygora goats, one of whom has the most soft, beautiful fleece, matter of fact it’s the only reason I haven’t whacked him upside the head yet, but do I know what the heck to do wit’ him? Nooooo I’m a dum dum.